The pie might be quite wet when you first cut into it. If so, pour off (or drain with paper towels) any excess liquid after cutting the first slice. Also, the original recipe calls for peeling the tomatoes. I didn't bother with this step and the peels in the final product didn't bother me. If you want to peel the tomatoes, cut an X in the bottom of each tomato and drop into a pot of boiling water for 10 seconds. Immediately transfer tomatoes to a bowl of ice water to cool. Peels should come off easily. Place a rack in the center of the oven and preheat oven to 400 deg F.
Combine flour, baking powder, and 3/4 tsp salt in the bowl of a food processor. Pulse ingredients together until well mixed. Add cold cubed butter and pulse until mixture resembles coarse meal. Pour milk evenly over the top and pulse until mixture just comes together into a dough. Gather dough into a ball and transfer to a well-floured surface. Cut dough into 2 equal pieces. Wrap one piece in plastic wrap and place in the fridge. Using a well-floured rolling pin, roll out the other piece of dough into a 12-inch round. Gently transfer dough to a 9-inch pie dish and trim overhang. Whisk together mayonnaise and lemon juice until well blended. Arrange half of tomato slices in the pie dish, slightly overlapping slices. Sprinkle half of corn over tomatoes. Sprinkle 1 tbs basil, 1/2 tbs scallions, 1/2 tsp salt, 1/8 tsp pepper and half of grated cheese over the top. Repeat layering with the remaining tomatoes, corn, basil, scallions, salt and pepper. Pour lemon-mayonnaise mixture over the filling and top with the remaining grated cheese. Remove second piece of dough from the fridge and roll it out to a 12-inch round. Place dough over the filling. Tuck any overhang under the edges of the bottom crust and pinch to seal. Cut four slits into the top crust and brush with 2 tsp melted butter. Bake pie until crust is golden brown and filling is bubbling, about 35 minutes. Transfer to a rack to cool. Serve warm. 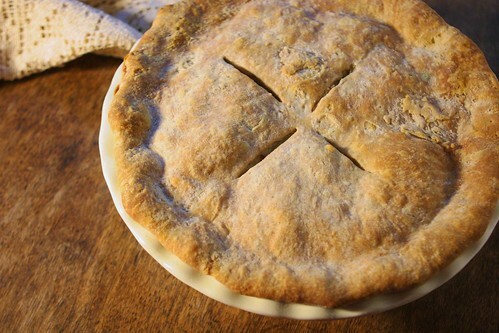 Leftover pie can be stored in the fridge (drain excess liquid before storing - see headnote). Reheat in a 350 deg F oven until filling is warmed through. If crust starts to get too dark during reheating, cover with foil. This looks delicious. 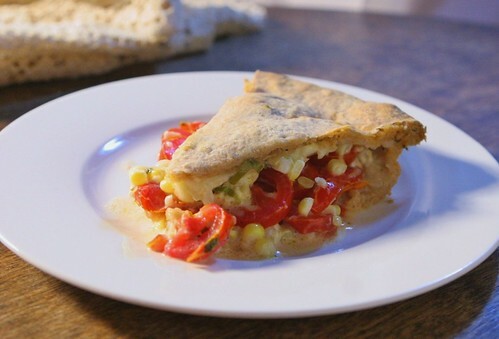 I hear you about keeping meals simple in the summer - I'm impressed you motivated to create this amazing pie! Sounds wonderful! A very summery dish! This looks like a great way to use my two favorite summer veggies! I've been meaning to make this since SK posted it also and yet.... You've inspired me though! I love pies! The new york catering team that I talked to created 10 different pies for my son's birthday party, and they were all great! That's a nice idea. I've never seen a dish like this before. Very inventive. I will suggest this to my friend who handles a pan asian restaurant london. He'll surely love this.